Gout is a type of arthritis and it is very complex. The American College of Rheumatology estimates that roughly 8 million Americans suffer with gout. This means that nearly 6% of men and 2% of women in the United States have gout. 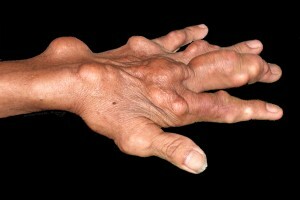 Interestingly, 5% of all diagnosed arthritis cases are gout. For more information on arthritis, please read Revolutionary Arthritis Treatment: An End To Chronic Pain. These attacks occur when urate crystals accumulate in the joints. Normally, uric acid dissolves in the blood and passes through the kidneys into the urine. The human body produces uric acid when it breaks down purines. Purines are naturally found in your body, as well as in food such as organ meats, anchovies, asparagus, mushrooms and herring. Sometimes, however, the body has either too much or too little uric acid. With too much uric acid in the body, it starts to form sharp urate crystals which stab the joints or surrounding soft tissue, causing intense pain and inflammation. Hyperuricemia is an abnormally high level of uric acid in the blood. Surprisingly, hyperuricemia is commonly found in many people who never develop gout! Your chances of developing gout are higher if you’re overweight and the disease is more prevalent among men, but women become more susceptible after menopause. Signs are usually acute and come suddenly without warning. Many patients experience heightened symptoms at night. Severe pain in joints is experienced, including the ankles, hands, wrists, knees or feet. The first sign is mostly the big toe, after which it spreads. Many describe affected areas as warm or hot. Gout can last for over a week if left untreated and sometimes pain gradually dissipates. When the gout subsides, skin around the affected area may become itchy and peel. Redness and inflammation with tender, swollen joints in the painful areas. Red or purplish skin around the affected area which usually makes patients think they have an infection. Some experience an elevated temperature (fever). Less flexibility – affected joints may be difficult to use with limited movement. No symptoms – in these cases it may develop into chronic gout. Nodules may appear in the elbows, ears, or hands. A study conducted by the University of Nottingham on the population of Taiwan, where there is a high rate of gout, found that the condition strongly clusters within families. According to research published in the Annals of the Rheumatic Diseases, foods rich in purines, particularly the ones found in meat and seafood, quintuple the immediate risk of a flare-up. If you would like more information on diet and disease, please read Healing Your Body With Gerson Therapy. Did you know that in 1977 there were 16 cases of gout for every 100,000, compared to 42 per 100,000 in 1996. 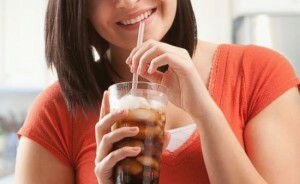 Could this be because of the link between sugar-sweetened sodas? According to researchers from Boston University School of Medicine, females who regularly consume beverages with a high fructose content are 74% more likely to develop the disease, compared to women who consume such drinks no more than once a month. Prevent gout by maintaining a healthy weight, limiting your alcohol consumption, drinking plenty of water and eating potassium rich foods. Please read Amazing New Gout Cream Really Works if you would like more information on how to treat this condition.